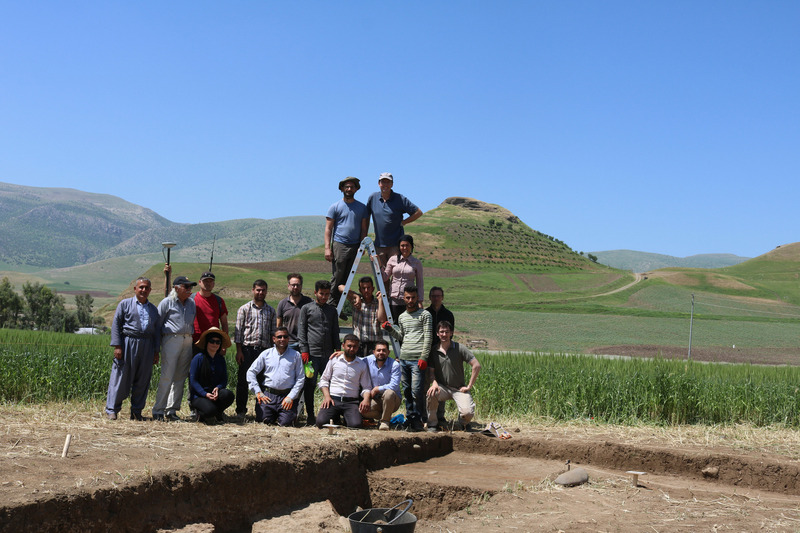 Starting point for the excavations in the spring of 2017 were the results of the magnetometer survey in the autumn of 2016. Under a small elevation east of the road leading from the main road between Qaladze and Nureddin to Qalat-i Dinka (fig. 1), three monumental buildings surrounded by a free space were identified, covering an area of approx. 1850 m2. A rectangular Building K (approx. 280 m2) encloses an approx. 800 m2 square building in the northeast. Building M (about 650 m2) in the north-west of Building L is separated from its neighbor by a narrow alleyway. Fig. 1: Drone photo showing Qalat-i Dinka and Gird-i Bazar. In red are the areas excavated so far. Photo by Iconem, courtesy of "Un Film a' la Patte" and Jessica Giraud. In the spring 2017 campaign, the aim was to obtain more detailed information about the buildings through archaeological excavations: Can the buildings be dated? Do they belong to the same occupation phase of the settlement as the findings recorded in the excavations of Gird-i Bazar and Qalat-i Dinka? How close to the surface are the findings and are they threatened by current agricultural activity? How were the buildings made and used? How deep are the floors? Do younger graves or looting pits disturb the archaeological evidence? Are the buildings worth further excavation and preservation? In order to answer these questions, a U-shaped test trench was opened to touch on part of all the three buildings (fig. 2). The width of the trench is 2m and its length in its east-west extent is 18 m. In the east and west, north-south oriented trenches with a length of 8 m and a width of 2 m are attached. In total, an area of 68 m2 was examined. The western trench is located in square 234934, the southern trench in square 235934 and the eastern trench in square 236934. This trench was called Dinka Lower Town Operation 2 (because operation 1 is Gird-i Bazar itself), and abbreviated DLT2. 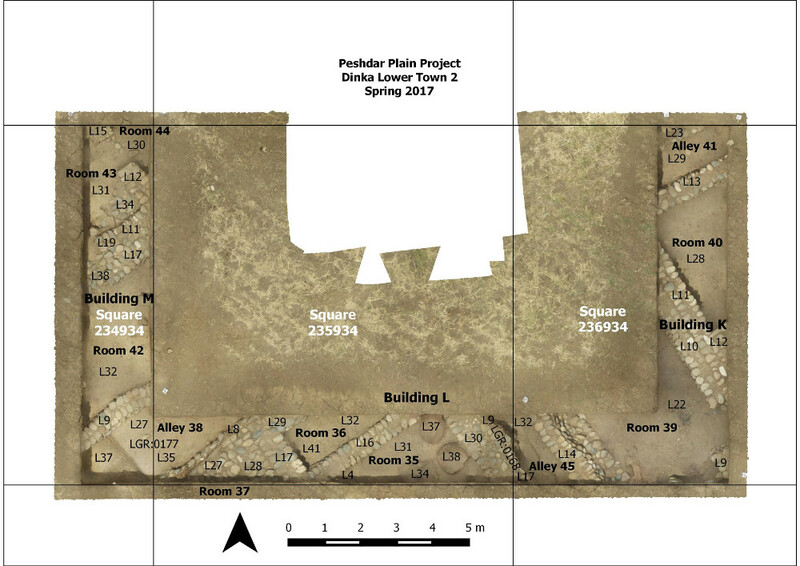 An important result of the spring 2017 campaign was that the excavations unearthed corresponding findings at exactly the places where the magnetometer survey had suggested walls and buildings. The archaeological findings, i.e. walls and storage vessels, are preserved immediately below the ploughing zone about 20-25 cm below the recent site surface (fig. 2). Fig. 2: Orthophoto showing the Dinka Lower Town 2 trench (DLT2). The floors of the buildings are located about 1.5 m below the site surface. Since the floors of the alleys between the houses are connected to the walls of Buildings K, L and M, it is to be assumed that the buildings were inhabited in a common occupation phase. In all rooms, ceramic inventories were found which resemble the assemblage known from Gird-i Bazar and can therefore be provisionally dated to the same period of use. These pottery-informed dates shall be checked against the absolute dates of the use of Buildings K, L and M to be provided by C14 analyses of botanical remains from their floors. The area exposed in the test trenches is too small to allow for accurate statements about the function of the buildings. The size of Buildings K (about 280 m2), L (about 800 m2) and M (about 650 m2), which can was revealed by the geophysics, indicates that they were of central importance to the lower town. The discovery of large jars sunk into the floor of room 35 in Building L may point at a function as a storage area of this building or even the entire area. However, this hypothesis needs to be confirmed by future investigations. During the 2017 spring season at DLT2, 104 pottery collections have been recovered, consisting of 798 diagnostic sherds and 4207 non-diagnostic sherds. A total of 103,7 kg of pottery has been retrieved. Interestingly, the DLT2 pottery closely parallels that from Gird-i Bazar. The burnished carinated bowls, hemispherical incurved rim bowls, the pots with lugs and handles, and the necked jars occurred in all three buildings L, M and K and in the alleys 38, 41 and 45. The cooking pots characteristic of Gird-i Bazar are also among the characteristic types of the DLT2 assemblage. 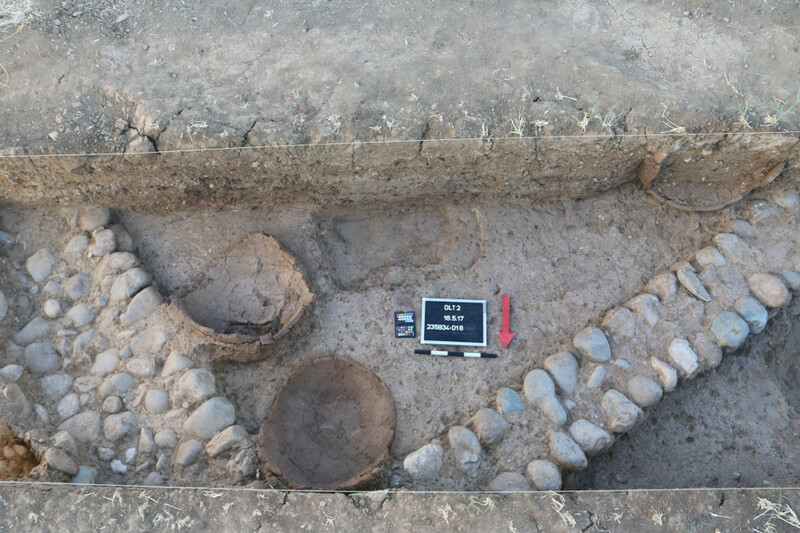 The main discovery for this season consists of the remains of 3 large storage jars of a maximum diameter of around 50 cm found in room 35 in building L (fig. 3). Fig. 3: Large jars sunk in the floor in Room 35 (Building L). These jars are made of a type of material that is not very resistant to water, so they were not suitable for storing liquids, unless some sort of water-repellant coating was applied. No traces of such a material have been found, however. A fourth jar, which was not fully excavated because it was found in the southern baulk, is characterized by the same material as the large jar discovered in 2016 in Gird-i Bazar, and could have been more suitable for storing liquids. As for the the small finds collected from operation 2 in the Lower Town of Dinka, these are simple utilitarian objects of everyday life. As in Gird-i Bazar, no elite or luxury objects were found, indicating the utilitarian function of the DLT2 buildings. Stone tools are the most common, following a trend observed already at Gird-i Bazar, followed by metal and ceramic objects. 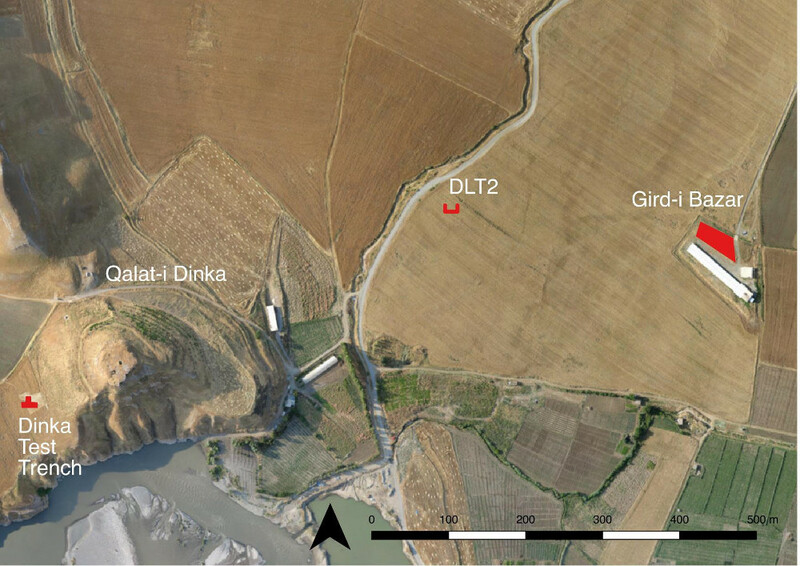 A few differences in the object range and concentrations between DLT2 and Gird-i Bazar may suggest that the DLT2 buildings had a different function from those excavated so far in Gird-i Bazar, and suffered a different abandonment process from the latter. To sum up, the Dinka Lower Town 2 excavation allows the target period of the Peshdar Plain project, the 9th - 7th Century BC, to be further investigated on a large area. Since no younger buildings, graves or looting pits were found in the test trenches, no major disturbances are to be expected in further excavations of Buildings K, L and M. It should be noted that a continuation of the excavations in Dinka Lower Town 2 would enable us to gain an extensive knowledge of this area, which seems to be of central importance for the Dinka Lower Town.